Fill the muffin tray with cases. In a large bowl, fully mix together the flour, caster sugar, cocoa powder, salt, baking powder, and bicarbonate of soda with a wooden spoon. Spoon the mixture into the cake cases, then tap the tray on the side to make the bubbles pop (to slow the rising agents from working too quickly). Once baked, take the tray out and leave the cakes in the tray cooling for 10 mins, then take the cakes out, and cool completely on a wire rack. Using a mixer, whip the margarine and vegetable fat, until they are completely combined. If using suet, make sure there are no lumps left, using the back of a spoon against the side of the bowl will help to break the pieces up (or very slightly melt the suet first - to soften, not melt!!). Mix in the vanilla extract, mint extract, and green colouring. Add half of the icing sugar and half the milk, and mix slowly to ensure it mixes in without going everywhere! Mix in the rest of the icing sugar and milk. Add a little extra milk or icing sugar if it's too thick or soft. Pipe the frosting onto the top of the cakes. 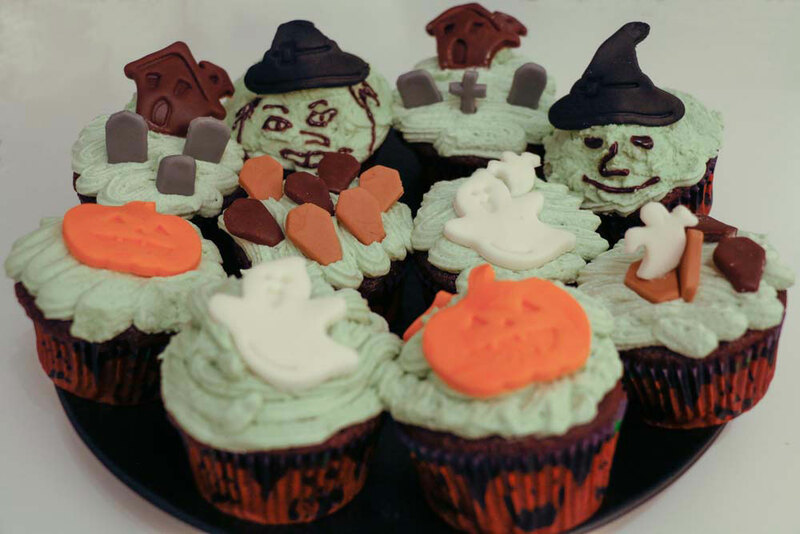 Roll out the coloured icing to approx 3-5mm thick, and cut out halloween-y shapes. 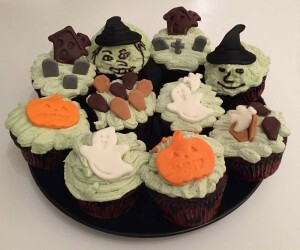 Arrange the shapes onto the cakes, and use the writing icing/gel to add final touches.